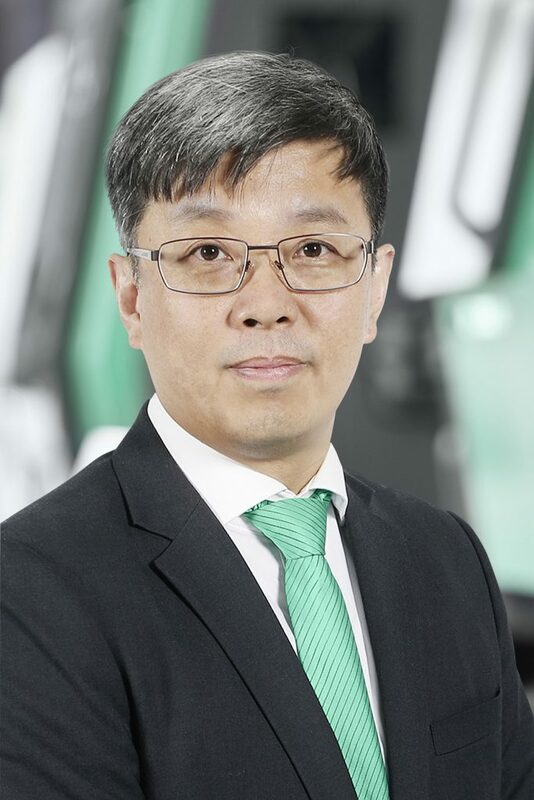 Arburg will be presenting the digital future of plastics processing at Chinaplas in Guangzhou, China, from 21 to 24 May 2019. At stand A41 in hall 5.1, several topics relevant to the subject of digitalization will be presented: the new customer portal, the potential of augmented reality (AR) for service purposes, as well as digital assistance systems. The application highlight will be a complex turnkey system that produces ready-to-use LSR/LSR wristwatches within the injection moulding cycle. Other exhibits are an electric Allrounder from the Golden Electric series for a medical application and a Freeformer 200-3X for industrial additive manufacturing. The three exhibited machines are networked via the Arburg ALS host computer system. Arburg has more than 30 years of know-how in IT-networked production. In addition, the globally positioned company is advancing the digitalisation of its business processes and services. The portfolio for IT-networked and production-efficient plastic parts production ranges from digital assistance packages, predictive maintenance and remote service to the new customer portal and Arburg’s own MES, the ALS host computer system. As a central component of Industry 4.0, ALS enables online data exchange across production facilities and locations (horizontal integration) as well as with a PPC/ERP system (vertical integration). At Chinaplas, all machine exhibits are networked via ALS. The new customer portal, which will be presented in Guangzhou for the first time in a Chinese version, provides a variety of services in a clear and well coordinated manner using a cloud-based solution. The central applications (apps) include the «Machine Center», which contains important information and documents for each machine, the «Shop” for ordering spare parts and the «Service Center». 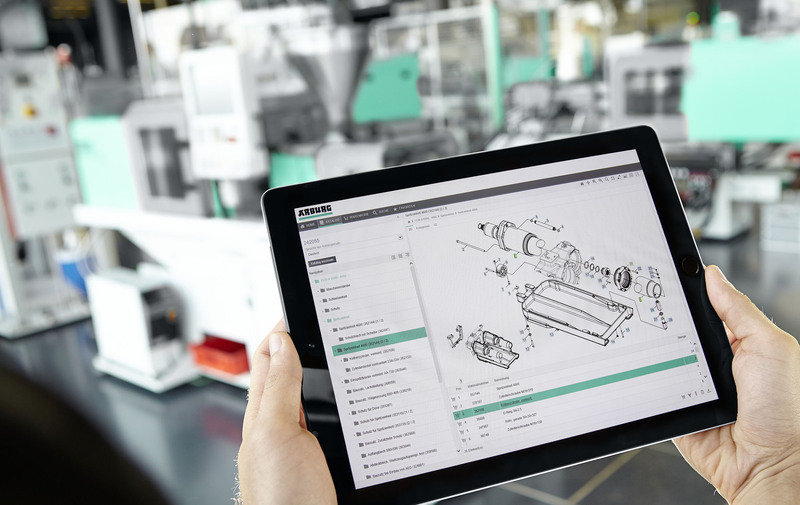 In addition, visitors have the opportunity to find out more about the six digital Arburg assistance packages for starting, setting up, optimising, producing, monitoring and servicing Allrounder injection moulding machines and experience the potential of augmented reality (AR) for service purposes at first hand by means of a practical example. 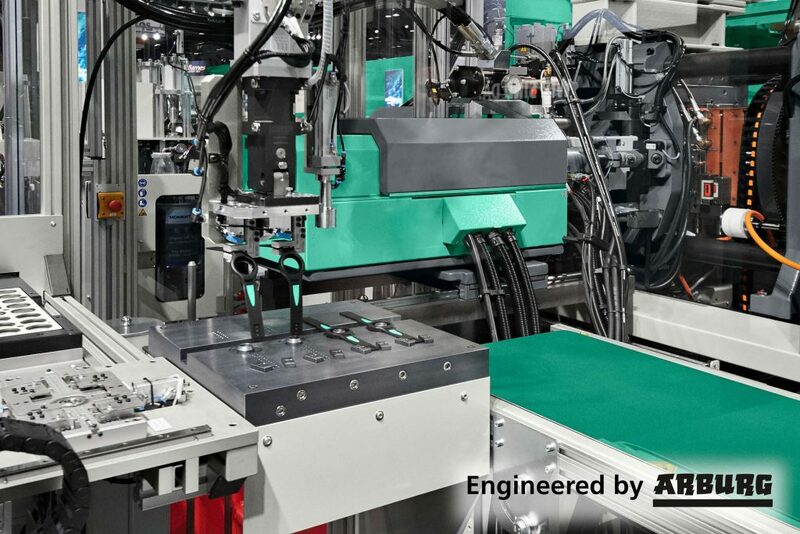 Assembly within injection moulding cycle: a turnkey system uses a hydraulic two-component Allrounder 570 S and a linear Multilift V 15 robotic system to produce two ready-to-use wrist watches in 70 seconds. Arburg is a pioneer in liquid silicone and multi-component injection moulding and looks back on many years of turnkey expertise. Production of LSR/LSR wristwatches will be showcased at Chinaplas 2019 as an application highlight and as a benchmark for what is currently possible using LSR processing. A hydraulic two-component Allrounder 570 S with a clamping force of 2,200 kN and size 400 and 70 injection units arranged in an L-configuration fully automatically produces two bicolour wrist straps made from the LSR materials Silopren 2670 (hardness 70 Shore A) and 2630 (hardness 30 Shore A) in a cycle time of 70 seconds. The 2+2-cavity mould is made by Rico, the LSR dosing unit by 2KM. Their new «CPP reader» camera system automatically detects whether the correct barrel has been loaded for each of the two LSR components. Assembly of the wristwatch takes place within the injection moulding cycle, by means of a linear Multilift V 15 robotic system. It removes the wrist straps and sets them down in a cooling station and then in an assembly station. Here, they are fitted with the watch housing and a ready-to-use clasp. Another multi-component application is exhibited by partner Mehow at stand B81 in hall 5.1. Here, a hydraulic two-component Allrounder 470 S produces water cups from PC and LSR. Handling is performed by a six-axis robot. An automated Allrounder 370 E Golden Electric will be used at Chinaplas 2019 to demonstrate that the Golden Electric series is suitable for the precise production of medical technology parts: The exhibit with a clamping force of 600 kN produces breathing masks for babies using a single-cavity mould from Mehow. The 2.98 gram moulded parts made from PC are removed and set down by a Multilift Select linear robotic system. The cycle time is around 15 seconds. The open Arburg Plastic Freeforming (APF) system offers great freedom in terms of materials. Users can process their own original materials and optimise droplet size as well as process control themselves. The process is based on qualified plastics in the form of inexpensive granulates, which are also used in injection moulding. At Chinaplas 2019, a Freeformer 200-3X as well as various functional components made of different materials will be presented, including parts made from only recently qualified materials. Arburg has also added the large Freeformer 300-3X to its portfolio. This three-component machine can additively produce complex and resilient functional components in hard/soft combinations, made from two plastic components plus support material. The new Freeformer also offers more space and higher temperatures in the build chamber and can be automated and integrated into networked production lines.